Welcome to the My Creative Time 45th Edition Release Blog Hop! You should have arrived here from the very talented Jessica. If you just happened upon here, you might want to head over to Emma's blog, to the beginning of the hop. This is a very fun release, and I hope you are as excited about it as we are! I have two cards for you today. 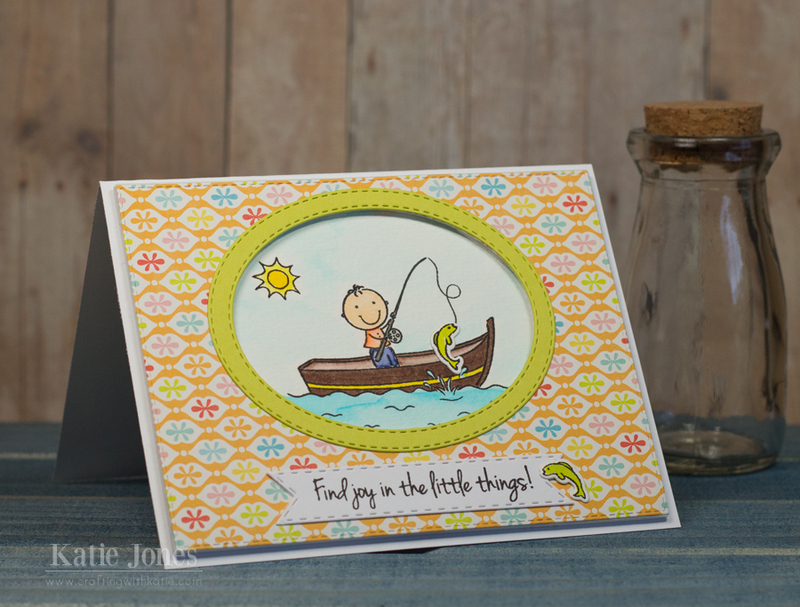 This first one uses the adorable You're a Great Catch stamp and die set. For my card base, I used a cut from the Cricut Create a Critter cartridge. Then I took the water layer and trimmed it with one of the darling stitched wave dies included in You're a Great Catch. There are actually two different water dies in this set! Next I stamped the fish, bubbles, and plant and colored them with my Zig Clean Color Real Brush Pens before die cutting them with the coordinating dies. After adhering them to the card, I added some Glossy Accents to the bubbles and the fish's eye. The cute little sentiment is just one from this set! My next card was made using the darling little Find Joy in the Little Things stamp and die set, which is yours FREE if you are one of the first 150 shoppers today (more info below). I stamped the image on watercolor paper and colored it with the Zig Clean Color Real Brush Pens. I created a frame for the image using one of the Stitched Rectangular Frame Dies and a couple of the Stitched Oval Dies. I also used a die from Vintage Stitched Label for my sentiment. There are THREE sweet little sentiments included in this freebie set! Finally, I stamped, colored, and die cut two little fish and added them to the card. The fish dies are included in Find Joy in the Little Things! Here's a closer look at You're a Great Catch. It is available for purchase now in the My Creative Time Store! Our "Freebie" for this release is this adorable "Find Joy in the Little Things" stamp and die set. It will be given to the FIRST 150 shoppers! If you are one of the first 150 shoppers, it will be automatically added to your package at the time of packaging/shipping. Once the first 150 shoppers come through, the die will be available for purchase. So if it's for sale in the store, you are not one of the 150. No exceptions will be made. This freebie die is not a part of the "bundle" and will be sold separately! Also, DON'T FORGET our sale that is starting RIGHT NOW here! Use the code JULY2015 to receive a discount off your entire purchase! This sale applies to "IN-STOCK" items ONLY. This sale will end on Friday, July 24th, at midnight PST. I just LOVE BOTH of your cards & your coloring is FABULOUS!!!!!! Thank you for your AWESOME sneaky peeks this entire week!!!! Both cards are just amazing! So love the fishbowl card, too cute!! Awww love cards! Thanks for a great week!!! Both these cards have an" AWE" factor! The fish bowl is adorable, perfect for so many occasions. I love the inlay effect on the second one and that freebie stamp set is simply adorable! Those cards are so adorable. I just love the fishbowl card, too cute!! Great idea to go to your cutter for the nice bowl shape card! Love how you colored your fish. Your little fishing card is adorable...I like the frame and that you put a fish on the sentiment! Sweet job. OMG Miss Katie WOW!! 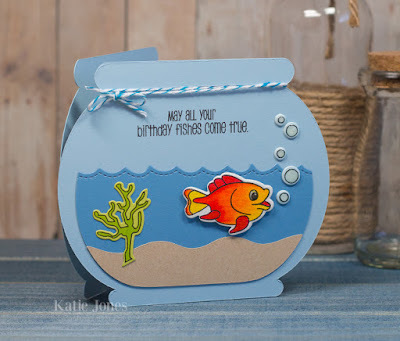 First off love your fish bowl card it's too cute...so thanks for the heads up about Create a Critter cartridge as it's perfect way to showcase the gold fish....I am so going to use your idea for a LO. Love your Freeby stamp set card it's so darling great little scene and love how you created the window effect great paper choices too. Your water coloring on both cards is Fabulous. Thanks for all the creative inspiration. YOU so ROCK!! Such fun cards! I love the bright coloring on the fish on the first card. Both cards are great. Love the coloring. Love the fishing theme - got lots of fishermen in my life. Always love new ideas. Very creative. Katie ~ First of all that fish bowl card is ADORBS!! OMG!! Then your fish is seriously EPRFECT! LOVE how you colored it! 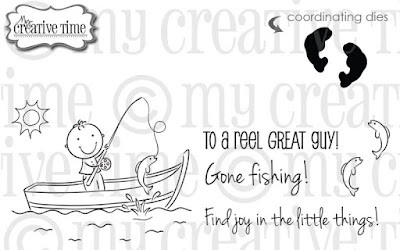 Then your CUUUTE little freebie fishing guy ~ so darn CUTE!! FABULOUS job all week! Love both of your cards, you do such great coloring. The fish bowl card is so cute! Thank you for sharing all your beautiful projects this past week. Enjoyed them all. Love the shape of the card. The "sand" and water filling the bowl is great. The fish are darling. Love both of your cards! 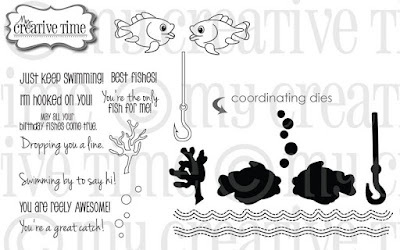 Absolutely, love the shaped fishbowl card and your colouring on the fish is fabulous! Fantastic job. 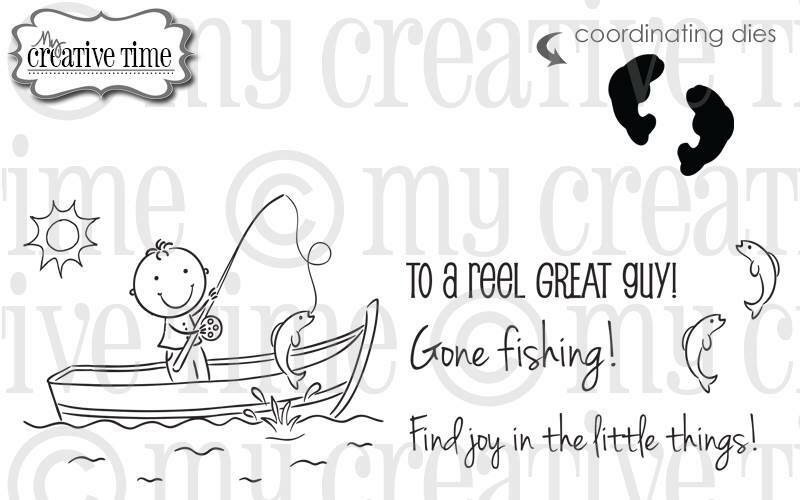 Love the design and colouring of your little man fishing too! Both of your cards are sooooo cute Katie!!! Cute--I like the fish bowl shape on the first and the framing of the scene on the second. Both of them are just too cute. Loving that little fishy bowl!!! Fabulous creations! Too cute! Love the fish bowl shape of the first card also! These cards are so super ADORABLE Katie!!! Fantastic creations! Love the colors you picked for both. Your water coloring is amazing too! I absolutely love both of your cards! ADORABLE!! Both of your cards are fabulous Katie!! I love...love your coloring!! WOW!! Both of your cards are wonderful. I loVe your fishbowl shaped card. Thanks for sharing. Adorable cards Katie! I especially love the fish bowl one, TFS! which goes perfectly with these sets! Thank you for sharing such adorable inspiration with us! I can't wait to use the You're A Catch die set!